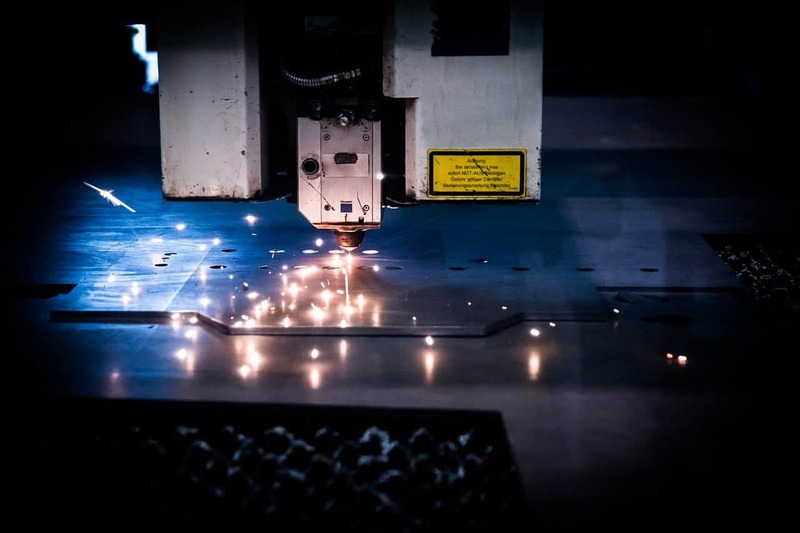 Although Fractory’s focus is laser cutting services, our capabilities include other manufacturing methods. This article explains our competence. We offer our services online. In short, you can upload your files to our platform and get an instant price quotation. For this, we have provided you with a detailed guide to follow. All our manufacturing is done by automated CNC machines. CNC cutting is precise and giving the instructions is easy. The needed input from an engineer is a drawing with only cutting lines. This applies to both laser and plasma cutting. Our main focus is on sheet metal cutting. For that, we have a variety of machinery at our disposal – CO2 and fiber lasers with different resources. High powered lasers are 10 kW and the largest work-bench fits a 2000×6000 mm sheet. 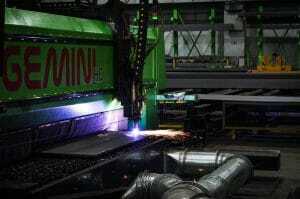 Plasma cutting is better suited for metal plates. The edge quality cannot compete with lasers but it is faster with thick materials. This allows for lower pricing. The largest plasma bench can fit plates up to 3000×12000 mm. Our services include tube cutting possibilities. 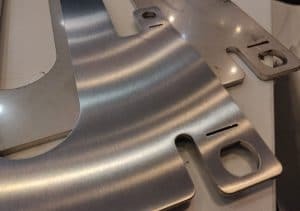 While we deal mostly with laser tube cutting, we also get simpler parts that don’t need that kind of manufacturing power. For those cases, we offer alternative options. Tube laser is a very flexible solution when tube or profile cutting is required. We have written an article that brings some examples of tube cutting use-cases. Suitable profiles are square, rectangular, round, oval, L-shaped and other beam types. The materials include structural steel, stainless steel, aluminum, copper and brass. Complex cuts are the major advantage of laser cutting. They are unrivalled with such jobs, as they provide great precision, repeatability and faster production. For cutting to length or angles, we have suitable options in state-of-the-art cold sawing machines. This cutting method is applicable to batch sizes upwards of 100 pieces. Cold sawing guarantees a lower price for simple jobs compared to a tube laser. Automated feeding and unloading system reduces the need for manpower which, in turn, keeps the costs low. The outstanding finishing quality renders deburring unnecessary. 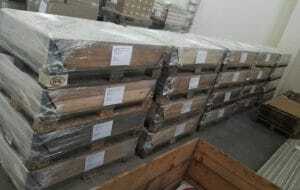 Suitable materials are construction steel, stainless steel and aluminum. Why should you choose us? That is a valid question everyone should ask when looking for a manufacturer. So we’re going to provide some reasoning. We treat quality as the pinnacle of our business. High standards bring recurring customers. Thus, we have tested our partners thoroughly before onboarding. Quality assurance includes deburring by default. Consequently, you don’t need to do any extra work. Fractory’s algorithm chooses a partner from a list of manufacturers. Among the factors it takes into account are a particular manufacturer’s capabilities and expertise, lead time and price. As a result, our large network makes choosing the optimal solution possible. Even if you have a single part, we will accept it. Adding it to a bulk order lowers the price. 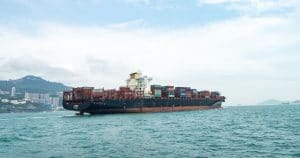 Our partners will also accept a unique one-piece order from us, while they wouldn’t do it with a new client. 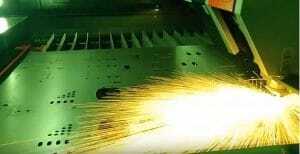 Our sheet metal laser cutting services are meant for everybody. We don’t have minimum or maximum batch sizes. Whether you are looking to produce the first prototypes or are ready to launch a new line of products, contact us. We get requests for all types of projects – from furniture and stairs to boats and self-driving cars. So far, our sales engineers have managed to help and gain knowledge throughout this process themselves. Don’t shy away from asking questions from these guys. Fractory takes packaging seriously. We have standardised requirements that apply to all our manufacturing partners. This ensures that the delivered parts are in good condition and proper documentation helps to sort the parts at the warehouse. You can get an instant price quotation if you have the right file types. This saves a lot of time. Also, this feature can be used in the development phase to compare solutions and their prices. All in all, that can have quite a remarkable effect on final costs. A lot of our clients require NDAs. We are happy to sign such contracts and have made web security a priority. When we distribute your drawings, they come without any data about you. Therefore, the information stays with us only, minimising informed parties. As you can imagine, tracing a random part back to its origins just by looks is, in most cases, almost impossible. Whether you reside in London, Liverpool or San Francisco, we deliver right where you wish. There is no need to look for manufacturers nearby because we have it all covered. Our pre-vetted manufacturing partners are in the UK, the Nordics, the Baltics etc. And this list is ever-expanding. This helps us keep the lead times low and reduce shipping costs. Still, if we do not have someone in your area, there is no need to worry. Some of our customers have ordered their parts to the other side of the world and still gotten a swifter and cheaper service than the one their local suppliers provide. Get a laser cutting quote in less than a minute!